Strikes just the right balance of irony and sincerity...genuinely heartwarming, from its opening dedication to Henson and Hunt to its joy-to-the-world finale. 86 min. Walt Disney Pictures. Director: Brian Henson. Cast: Michael Caine, Dave Goelz, Steve Whitmire, Jerry Nelson, Frank Oz. Following Jim Henson's sudden death in 1990, at the age of 53, the Jim Henson Company had to regroup. The Jim Henson Creature Workshop would have little trouble in continuing to produce state-of-the-art puppets and animatronics, but without the creative parent of the Muppets, could (or should) new Muppet adventures be produced? If so, who would play Henson's characters, most notably Kermit the Frog? The Muppets had been absent from the big screen since 1984's The Muppets Take Manhattan, but the Muppet creative team rallied to create another successful and fulfilling family tale. Screenwriter Jerry Juhl—the Muppets' most consistent scribe since The Muppet Show—penned the surprisingly faithful adaptation of Dickens' enduring novella (sadly, Juhl also passed on, in 2005). Longtime perfomers Frank Oz (Miss Piggy/Fozzie Bear/Sam the Eagle/Animal), Dave Goelz (The Great Gonzo/Dr. Bunsen Honeydew/Betina Crachit/Zoot), Jerry Nelson (Robin/Ghost of Christmas Present/Floyd/Lew Zealand), and Steve Whitmire (Rizzo the Rat/Kermit the Frog/Beaker/Bean Bunny/Belinda Crachit) return to play the Muppets, who in turn play the Dickensian roles. Michael Caine takes on the key role of Scrooge, one of relatively few humans seen onscreen. Perhaps Caine showed up to return a favor to his Dirty Rotten Scoundrels director Frank Oz, but he clearly relishes the role. Caine's powerful performance is good enough to carry a straight, human retelling of A Christmas Carol. Beside bringing the requisite commitment to act convincingly with felt scene partners, Caine nails Scrooge's character arc from a sad, ferocious, self-centered jerk to blissed-out lover of life. Paul Williams, who with Kenny Ascher penned the songs for The Muppet Movie, contributes seven new songs. As Charles Dickens, Gonzo narrates the film. Juhl struck gold by pairing Gonzo with Rizzo the Rat in a double-act, with skeptical scaredy-rat Rizzo a delightful counterpoint to daredevil weirdo Gonzo. "Scrooge" introduces Caine's nasty tightwad as he strides through the London streets on the way to work. Scrooge's clerk Bob Cratchit (Kermit) appeals to Scrooge's penny-wisdom to secure a day off for himself and his rambunctious rat colleagues, leading to the good-natured "One More Sleep 'Til Christmas." Alone in his chambers, Scrooge is haunted by the ghosts of Jacob Marley...and Robert Marley, played by Muppet hecklers Statler and Waldorf (now performed by Nelson and Goelz). In "Marley and Marley," they warn Scrooge to repent and deliver an admonition of ghosts to come. The incandescent Spirit of Christmas Past guides Scrooge through a remembrance of things past: his lonely upbringing and his painful, young-adult loss of love. The Ghost of Christmas Present, a jolly giant, sings "It Feels Like Christmas," then shows Scrooge the squalor and love of the Cratchit family. Bob and his wife (played by Miss Piggy) have a brood of boy frogs and girl pigs...what else? Little, lame Tiny Tim (played by Kermit's nephew Robin) leads his kin in "Bless Us All." It's up to The Spirit of Christmas Future definitively to put the fear of God into Scrooge, who returns to his chambers "With a Thankful Heart." The film's brief closing number, "The Love We Found," is actually a reprise of a longer number cut from the film, then reinstated on most home-video versions (Meredith Braun, as Scrooge's lost love Belle, sings the cut number with Caine). Ironically, of Williams' nice but almost sickly sweet songs here, "The Love We Found" is the best. Though working on a less-than-generous budget, Henson works minor miracles of family entertainment. Entrancing production design—including a forced-perspective set and terrific puppets—and a number of magic moments (try to resist Kermit's brief duet with Robin) add up to a family film with serious replay value. The Muppets' good humor remains intact, but Juhl strikes just the right balance of irony and sincerity, allowing The Muppet Christmas Carol to be genuinely heartwarming from its opening dedication to Henson and Hunt to its joy-to-the-world finale. 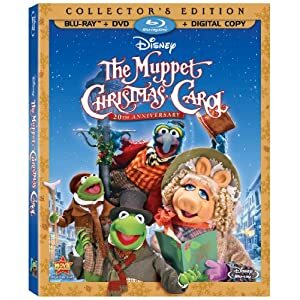 Disney's 20th Anniversary Edition of The Muppet Christmas Carol in a Blu-ray + Digital Copy combo pack (or a Blu-ray + DVD + Digital Copy combo pack available exclusively from Amazon.com) delivers a family favorite a top-notch A/V upgrade with a few new bonuses. Die-hard Muppet fans will either want to pick up the Amazon exclusive or hold on to their old DVDs, though, since the new Blu-ray does not include—either in the feature or as an extra—"When Love Is Gone," a deleted song included on some previous releases and beloved by many fans; the song is apparently included on the DVD in the Amazon-exclusive combo pack, though that's not the version made available to me for review. The "Kermit's 50th Anniversary Edition" DVD included motion menus with original Kermit material, while the new Blu-ray includes brand-new Muppet video footage by way of "Disney Intermission." When one pauses playback of the film, the new footage appears, with Muppet penguins, chickens, and rats comically performing traditional Christmas carols. Unquestionably, the feature gets its best home-video presentation to date in the impeccable hi-def transfer on the new Blu-ray disc. Unlike the DVD, which strained to present both a widescreen and pan-and-scan version of the film on one disc, the new Blu-ray handily presents a natural and well-resolved filmic image with strong detail and accurate color (give the film a moment to get past its optical credits sequence to see the full effect of the new, sharper image). The DTS-HD Master Audio 5.1 upgrade is a definitive audio presentation that maximizes the original audio in clarity and fidelity: muci is full and dialogue always clearly prioritized. The Blu-ray retains two brief features hosted by Gonzo and Rizzo—"'On the Set' Gag Reel" (2:33, SD) and "Christmas Around the World" (2:57, SD), a swift but informative holiday tour—as well as the faux-bio featurette "Pepe Profiles Presents—Gonzo: A Portrait of the Artist as a Young Weirdo" (5:29, SD), which is worth watching for its handful of good bad jokes. Reinstated after skipping the last DVD release is the making-of featurette "Frogs, Pigs, and Humbug: Unwrapping a New Holiday Classic" (21:56, SD) with Henson, Gonzo and Rizzo hosting; the featurette includes interview snippets with Muppet performers and Michael Caine, as well as behind-the-scenes footage of the Muppeteers in action. If indeed "When Love is Gone" remains on the DVD included in the Amazon-exclusive combo pack, you'll find the deleted song in Chapter Five (time index 44:45) of the fullscreen version. All site content © 2000-2019 Peter Canavese. Page generated at 04/20/2019 11:46:14PM.